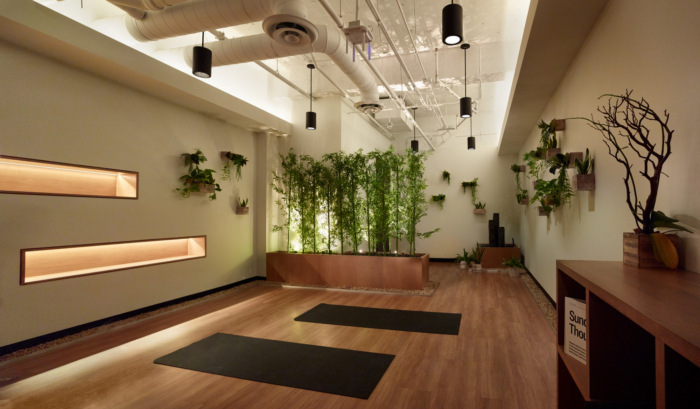 BOX Studios were engaged by data analytic company, Uptake, to design their headquarters located in Chicago, Illinois. Innovation is a constant at Uptake Technologies. Headed by Brad Keywell, Uptake is a data analytics company that combines machine learning and IoT technology to help organizations improve their operations. By harnessing the power of data to provide opportunities and insights for their clients, the company’s platform is used to predict equipment failures, reduce energy usage and prevent unnecessary downtime. Uptake’s company culture revolves around creativity, innovation and use of cutting-edge technologies, all of which influence the design of their Chicago headquarters – a landscape rich for exploring. BOX Studios was given the task of developing a space that would provoke thinking, problem-solving and play without being sterile or whimsical. Uptake employees can meet in a variety of unique spaces with different design personalities. The workspace needed to be open and airy, yet provide some acoustical isolation between teams. BOX developed a plan based on the civil planning model of thoroughfares and side streets. “Thoroughfares” were created within the office by using partial-height, demountable glass partitions in heavily traveled areas. The partitions limit access to the “side streets,” which form team areas with sit-to-stand workstations and more partial-height, demountable glass walls that segregate meeting pods for adjacent teams. The glass is dual-purpose serving as a white board for brainstorming sessions, as well as providing acoustic separation without interrupting the visual expanse. Uptake’s training room, Uptake University, re-imagines the typical classroom as a space for problem-solving and exploration. State-of-the art audio-visual equipment allows video conferencing with distributed audio and microphones for interactive virtual sessions, while authentic school-house furniture keeps the emphasis on continuing education with the staff. The atrium is used for a variety of functions. Custom-designed tables sit on casters allowing mobility at a moment’s notice, and removable table inserts provide ultimate flexibility in meeting sizes. Interior conference rooms and three-sided casual meeting pods are all equipped with A/V meeting equipment and tables with an integrated paper roll for brainstorming sessions. At the back of the atrium, internal staff can design and fabricate with screen-printing machines, wood-working tools, and 3D printers housed in the Maker Space. Don’t forget the coffee. Adjacent a cafe, BOX Studios designed a roof deck-inspired patio created to encourage casual collisions and impromptu meetings. 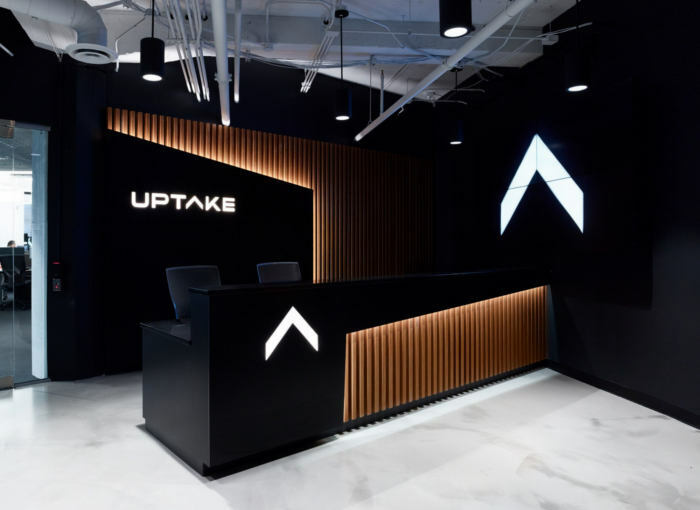 A custom millwork trellis takes the shape of the Uptake logo, keeping their branding image strong and mirrors behind the birch trunks create reflective depth giving the illusion of an expansive forest. If the noise of the break room is too much, staff will find solace in the library, a quiet zone sprinkled with a variety of colorful seating options, or the Zen Den, a space for yoga, massages, mindfulness and meditation. The final solution is a space in harmony with the ethos of Uptake. It is an eclectic blend of individualized areas combining the cutting edge technologies with human-centered design elements that create comfortable spaces which help employees excel in their everyday work environment.